It was very windy and dull this morning-hey, whats new for the beginning of August-which is why I look a bit fed up and windswept-haha!! Due to the ever changing weather we are having, todays outfit is the blazer I bought recently-it is navy with white hearts all over it and navy heart buttons, It is by Jaeger and was £2 at the boot sale. The long line grey vest top is by Gap, about £3, from the charity shop. 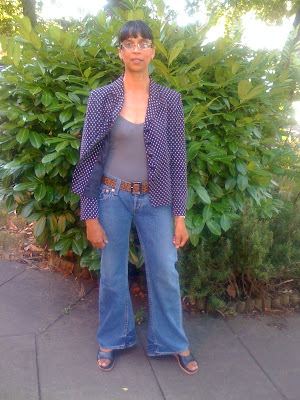 The jeans are low slouch widelegged jeans by Levi's and were £5 from the charity shop. Because the weather is so up and down, I'm fed up of floral dresses and starting to think more of Autumn. I went thrifting earlier, hoping to bag something in red tartan, but nothing doing. I didn't come back empty handed as I got a black shoulder bag by Carven, a slip, a short suit (romper!) for Eastbourne next week and a silk top by Gap. I love red tartan! Good luck with the hunt. 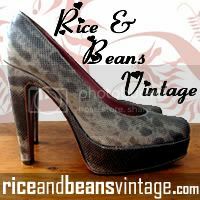 Hi rice and beans vintage-yes, my next find for Autumn, hopefully!! You are so dedicated and quick off the mark! Hi kate-the only thing with looking for something specific is you come home with other things you don't want to leave behind-haha!! I'm on the hunt for a nice light weight summer tartan sports coat (if such a thing can be found), let me know if you cross paths with my mystical creature! Sharon! That jacket is so cute!! I want it! Hi imelda matt-I could count on both hands the amount of tartan I've seen when I didn't want it-always the way!! Hi angel-so kind, thanks a lot!! Hi jaimie-always so lovely, thanks!! It's perfect, as it is so lightweight for summer! 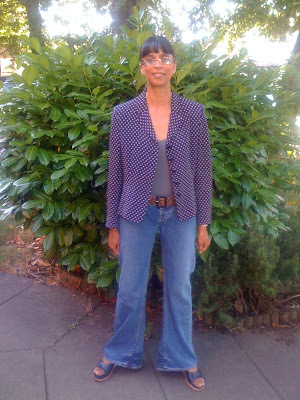 Lovely Jeans and also a lovely jacket! Hi nadine-thank you so much!! I like the picture where the breeze is catching your blazer. Hi wendy-LOL, you can see how perplexed I look because of it!! I´ve recently bought a navy jacket on reductions and I´m willing to put on it! The problems is the weather -hight temperature- Here the summer is really long. I like your look. LOVE those jeans! I can't resist a wide leg. aaah the wide-leg: work it, girl! Hi sal-thanks so much, they are very comfy too-haha!! Hi couture carrie-thanks and yes, I've been getting used to them all day!! i swear i want to fly you out to la simply to accompany me while i go thrifting. you always find the most amazing, affordable things! love the little blazer, the hearts make it so darling. Hope you will find that you looking for! Hi cupcakes and cashmere-you always say the loveliest things-if money was no object, I'd be there like a flash-haha!! Hi acielle-well, I think I might be trying too hard, I need to slow down a bit, haha!! Love the widelegged jeans! Now what you mean, it was hot when I left for work, then it started raining and the temperature dropped so much! Fall is here for sure. Tomorrow I am weariing my widelegged jeans for sure!! Sounded like you ended up with some great deals as usual!! Hi savvy gal-thanks so much!! I've about 10 pairs of jeans, but all differnet styles-I've done what you did before too, but I've slowly rebuilt my collection now! Hi Silje-the weather is soo eccentric-its not funny anymore!! Thanks and I look forward to seeing your wide legged jeans too! awesome wide-legs, they look like the real thing, i love that! Hi fashion herald-thanks for your lovely comment!! Oh I LOVE your blazer Sharon!! It's so amazing that your outfit only cost £10! This is a fabulous example of Cheap chic! Your jeans have a real 70s flair to them, fantastic! also i wanted to let you know I made a note to check out Miss Selfridges! You look comfy. Perfect for a Monday. Love those wide jeans..the jacket just dresses it up. Hot Hot..and oh so humid here in the heartland. You got out..you come back in..shower..and stay inside. You look great in this. I really like the tank/bodysuit underneath the blazer. Shows just enough to know you have a great figure! Hi danz-always so lovely, thanks so much my dear and have a great day!! Hi always in style-thanks a lot-I'm still on the hunt for the elusive tartan, haha!! Hi vain and vapid-thanks for your lovely comment!! Hi fashion chalet-that sound delicious what you ordered!! Have a great day my friend!! Hi jen-thanks so much-hope you have a great time on your travels!! Hi secretista-thanks, I didn't realise they would be this comfy-haha!! Hi ellie-thanks so much! thats the trouble when its too hot, you end up staying indoors!! Hi fashion frenzy-thanks for stopping by and for your comment too! Hi wendy-thanks very much my dear!! Hi jenny h-thanks for stopping by with your lovely comment!! Hi anjeanette-thats so lovely of you-thanks my dear!! Hi p-always so lovely, thanks!! Lovely outfit. I like the blazer! Hi bi-style-so kind, thanks a lot!! OMG THE POLKA DOT BLAZER IS AMAZING! You have the best wardrobe around! Hi Yiqin-always so lovely, thanks so much! !